Ecommerce is a booming field, and store owners have more tools at their disposal than ever before. But with all these options, how do you know which are the perfect products to sell on Facebook? While there’s no magic formula, in this article you’ll find a framework to follow in order to choose products that are likely to sell. You’ll be able to apply these steps to ecommerce product research in general, but we’re going to gear this process towards Facebook Store owners. Keep in mind, product research is something you should be doing consistently and constantly, whether you’re an established ecommerce veteran or just getting started with your first store. It’s imperative that you know how to quickly and effectively gauge your audience’s shifting tastes and any trends in your niche. The quickest way to build a list of hot products is to see what’s selling on the major ecommerce sites. These three sites are a great starting point because they sell a staggering range of products and serve virtually all retail niches. If you’re just getting started with the research process, this means you won’t miss out on any mainstream trend. Best of all, each of these leading sites allows you to sort by “best-selling” and filter by “category”. This means you’ll be able to quickly identify the most popular items in any category, broad or specific. If you already have a niche you’re committed to, or one that you want to explore, SimilarWeb offers a great ranking tool that allows you to filter by retail category or location. If you’re trying to decide between broad categories, you’ll quickly be able to identify the leading marketplace for more focused product listings. Another leading online retailer is AliExpress. Both AliExpress and its parent company, AliBaba, have become important links directly to Chinese suppliers. This is an especially important resource for dropshippers or anyone else looking into product sourcing and general pricing reference points. Like the other leading sites, AliExpress offers users the option to sort products by recent popularity. Using AliExpress in conjunction with a big retailer like Amazon will allow you to see what’s selling, how much markup you may be able to add, and what shipping times are like from China. We’ll get deeper into pricing later in this article, but it’s important to have a well-rounded strategy even at the most general level of product research. Action Step: Build a list of 10-20 popular products based on your research on these sites. Once you have a few product ideas, it’s time to do some market research. Google Keyword Planner is a good starting point. Enter a product, and you’ll get alternative keywords, Adwords costs, and a very rough idea how big the market is for that product. Signs of a good product to sell online include high average monthly searches and high competition. You’re better off taking advantage of hot products instead of trying to start a trend by yourself. Shapewear, for example, is a product category that meets these criteria. 100K – 1M average monthly searches is a wide range. We can worry about refining a target audience later in the process, though. For now, you’re simply looking for products that are being actively searched. Once you’ve run your product shortlist from Step 1 through the Keyword Planner, you’ll have a general idea how “hot” each product is. But that’s not the full picture. You need to put that search volume into context. Is the product trending? Has it trended in the past? Where is the product now versus 12 months ago? That’s where Google Trends comes into play. It’s a fantastic tool – maybe even more useful than the Keyword Planner. By running your product names through Trends, you’ll quickly get an idea how interest in each product is evolving. Remember, you want to jump onto healthy, existing trends rather than try to catch the first evidence of popularity. In order to do that, it’s important to consider the reasons behind a trending product, even if you have to make a few assumptions. If there’s a sudden explosion in the number of searches for a particular term, is that just a spike or the beginning of a long term trend? Take the vuvuzela, for example. Remember those annoying, loud, and very popular horns that were used by fans during the 2010 World Cup in South Africa? That summer, vuvuzelas were hot, but as soon as the World Cup was over, so was the interest in vuvuzelas. If one of your products seems to be exploding onto the scene, why is that happening? Is there a clear catalyst, like the World Cup? How long has interest been trending up? Enamel pins have been rising steadily and dramatically for almost two years. From a trending perspective, this is a healthy product category and should be researched further. Google Trends can also uncover key issues like seasonality. The term “fishing lures”, for example, suggests a very consistent rise in interest each summer. This may not make or break your product strategy, but it’s certainly something to keep in mind. Are you willing to deal with seasonality or would you rather handle a product that holds interest year round? Action step: Take your product list from Step 1 and run each product through the Google Keyword Planner and Google Trends. Make note of the market size and trend (if any) for each product. Now that you’ve got a clear list of products and a general idea what the market size and state is for each one, it’s time to take a step back and get into your potential buyers’ heads. Online communities, forums, and even magazines are a great place to start your buyer research because they represent focused audiences. In the case of magazines, those audiences are often already pre-qualified paying ones. Try and match each product on your list with a relevant online forum and magazine. The forum will allow you to watch fans of a niche interact with each other and discuss current topics and trends. You can even ask questions and engage directly yourself – just be careful not to be spammy. Remember, you’re still researching, not selling. While forums are examples of communities actively engaging, magazines are more structured. By scanning niche magazines, you’ll quickly get a feel for what industry authorities are discussing. In some cases, you’ll even be able to see what’s being advertised. Here’s an example from Field and Stream. These ads are another great way to build a list of hot products, gather price data, and get an idea of how specific products are being marketed. If the product list you built in Step 1 overlaps with products being talked about in niche publications and communities, you’re in great shape. If you don’t have any overlap, you can always take products you find in these publications and circle back to your product research on the online retailer sites. Action Step: Match each product on your shortlist with a forum and magazine. Is it being discussed and/or advertised? Finding products doesn’t have to be a completely cold process where you choose items based solely on popularity or search terms. Take some time to comb through your social media feeds to see what you’re naturally exposed to. Do you see friends’ posts or reviews about products they’re using? Are there influencers you follow who promote specific products? What sort of products are advertised on the podcasts you listen to? Tim Ferriss and Joe Rogan share a similar audience, and both promote products around performance enhancement, physical and mental. If you’re a listener to their respective podcasts, you’re probably very well-versed in the world of exercise, martial arts, and meditation. If that’s the case, consider searching for relevant trending products – you already speak that language, after all. If you don’t already do so, it’s a good idea to create an organized note-taking system to keep track of the conversations going on around you. You’re more likely to be in tune with these items because they’re within arm’s reach, so to speak. Let’s say you’re a young, single guy in his 20s. How much do you really know about baby clothes or products for the elderly? This isn’t to discourage you from pursuing a product outside of your comfort zone, but keep in mind that ecommerce success entails a lot more than just selecting a product. You’re going to have to design your Facebook Store and marketing campaigns around your buyers. By choosing popular, trending products more familiar to you, you may have a shorter learning curve and more effective messaging. Action step: Create a simple spreadsheet to take notes on what your community is talking about, buying, and selling. A few columns with product name, category, a link, and your notes will suffice. Do you see any overlapping products with your list from Step 1? By now, you’ve selected a product to focus on. It’s trending, it’s popular, and you feel comfortable moving forward with it. The next series of questions will help you define your audience and business model. Before going any further with the product you’ve chosen, you need to qualify the buyers you plan on selling to. The best way to get started is to build out several buyer personas that you think represent your potential customers. Buyer personas are flexible tools, and ultimately you’ll want to create one that really works for you. In the meantime, you can find plenty of templates online. 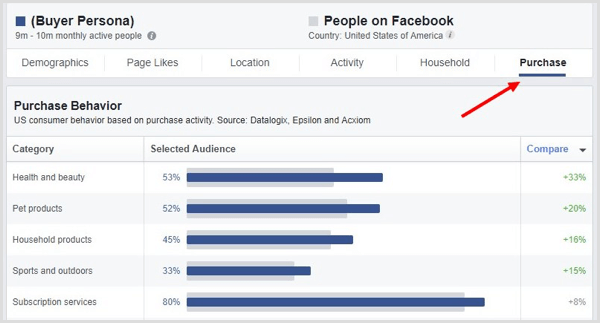 Since you’re selling through your Facebook Store, this is a good time to get acquainted with Facebook Insights. Remember using Google Keyword Planner to generate a basic idea about market size based on a search term? By creating a buyer persona on Facebook Insights, you’ll get a much more detailed view of your potential market and related audiences. This tutorial walks you through the process. Finally, you’ll want to find examples of the product you’ve chosen being sold on other Facebook Stores. This will help you triangulate your market, further develop your buyer personas, and learn how the product is most effectively sold. Action Steps: Complete at least one buyer persona for the product you’ve chosen. Create a relevant custom audience with Facebook Insights, and find examples of the product being sold on other Facebook Stores. There are many ways to sell a product on Facebook. You can link your Facebook Store to an external online sales platform or you can simply run the entire business on your Facebook fan page. With apps like jumper, you can enable sales directly from your brand’s Facebook page. Flexibility is not a problem these days. But you do need to make practical considerations before moving forward. Are you planning to dropship using a supplier? If your supplier is based in China, you’ll face longer delivery times and potential difficulty with customer service. If this is a potential deal breaker for your customers, you may want to consider sourcing products locally instead. Would you rather sell from inventory you stock locally and ship yourself? There’s much more implied up front cost with this model. Also, are you willing to package and mail your products at volume? Both models have pros and cons you need to weigh. Of course, you should also keep an eye on issues like legality and liability. Are you selling a food or drink item? Does your product require a special license? The easiest solution to these issues is to find examples of successful stores selling the same type of product. How are they reaching their customers? How are they packaging their products? Action Step: Find successful examples of your product or similar products being sold online, preferably through Facebook. You’re running a business. The most important question at the end of this entire process is whether or not the product or products you choose will net you a profit. How does that price compare to what your competitors are using? If it’s significantly higher than prices your competition is using, then it’s time to go back and either find a cheaper supplier or choose another product. You also need to consider the number of sales you can realistically achieve each month. For example, if you’ve chosen to sell relatively cheap products, like mobile phone cases, you need to drive a lot of sales to generate significant financial return. Selling fewer items of a higher priced product may be more achievable. Action steps: Use an online calculator or template to figure out your potential margin. Use your supplier price and yourcompetitors’ prices to get a rough estimate. As more people choose to shop online every year, ecommerce growth shows no sign of slowing down. As the industry grows, online store owners have an ever-increasing number of choices when it comes to ecommerce-enabled platforms, marketing, and sales tools. While these developments are exciting, store owners can’t forget good old fundamental aspects of running a retail business. One such element is your responsiveness to market trends and tastes. In such a quickly evolving industry, trying to stay on top of shifting markets can seem a little overwhelming – especially while managing the day to day operations of your business. The key to keeping your ecommerce store relevant and growing is to consistently conduct effective product research. Once you run through the research framework in this article, you’ll quickly be able to adapt it to fit your niche and your store. But don’t stop there. Now that you know where to search and what to look for, schedule a monthly product research session and a performance audit. Consistency is key. Commit to the process, and you’ll develop a great feel for what’s happening in the wider market and how to choose the best ecommerce products to sell.